In 1925 Inspektion für Waffen und Gerät, abbrev. 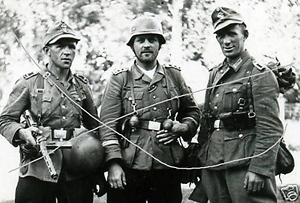 IWG – successor of Gewehr-Prüfungs-Kommission – opened new submachine gun trials on the Kümmersdorf test grounds. Purpose was to evaluate new development weapons that might be interesting as a new weapon for the German armed forces. One of the tested weapons was a weapon designed by Heinrich Vollmer, designer and owner of a factory in Biberach am Riss. Vollmer had already some experience with firearms design from the time of WW I. He presented his own development, a Vollmer Maschinenpistole VMP 1925. The weapon showed significant influence of the M.P. 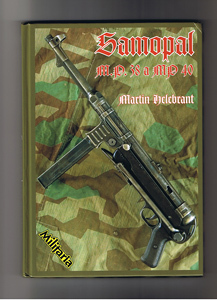 18,I, having a snail magazine with capcity of 25 (some sources indicate 32) rounds based on the Trommelmagazin used in early M.P. 18,I and LP 08. Vollmer moved the magazine into a vertical position, which reduced mass asymmetry and the weapon became more compact. On the handguard had the VMP1925 as a first European submachine gun a vertical pistol grip, for the first time encountered on American Thompson 1921 submachine gun. This front pistol grip will appear on all subsequent Vollmer submachine guns. For the first time the weapon also utilized new style of a field stripping, the same system as one can later observe on the M.P. 38 and MP 40 guns. On the bottom of the handguard was a vertical screw / pin. After pulling this pin out of the weapon, squeezing the trigger and turning the receiver with magazine well and barrel it was possible to remove the receiver forward, out from the body of the weapon. VMP 1925 fired only in full automatic regime and had no safety. Sights had two folding leaves, zeroed on 100 and 200 meters. This weapon existed probably only in a very few prototypes. None of the weapons submitted for the trials in 1925 was considered good enough to be adopted (and at that time also respected Treaty of Versailles did not allow Gemany to adopt submachine gun into the Army). Anyway, in 1926 IWG based on the results of trials decided to support financially Vollmer and asked for further development of his weapon. Development resulted in model VMP1926, very similar to the original VMP1925 but, in contrast to most of the temporary submachine guns, the VMP1926 had no cooling sleeve around the barrel nor had any cooling ribs on the barrel. It simply relied on the mass of the barrel to soak the heat generated by the shooting. VMP 1926 received the fire selector, located in form of a small lever right side of the stock, right above the front end of the trigger guard. The selector has two positions marked by letters E (Einzelfeuer = single shot) and D (Dauerfeuer = burst). The weapon has no manual safety, only safety notch for the cocking handle, similar as used by M.P. 18,I. The way of field stripping was also modified. Verticals crew on the handguard was replaced by a small lever behind the trigger guard. The field stripping procedure now was following: remove the magazine and check chamber. Set fire selector set on D, i.e. – full automatic regime. Now squeeze the disassembly lever and turn counter – clock wise the receiver. Now it is possible to pull the receiver forward, out from the weapon’s body. It looked as more simple way but it was not the luckiest one. If a shooter during the fire accidently squeezed the disassembly lever, the weight of magazine might turned the receiver and a runaway, uncontrolled burst followed untill the receiver either went out from the weapon’s body or the magazine was empty. Slightly surprising is that this way of disassembly remained unchanged in all Vollmer weapons further on, including later Erma EMP. Vollmer made VMP 1926 in a limited number and tried to sell it abroad, but had no success. Still it is interesting to mention that in 1927 Soviet armed forces, represented by Artileriyskiy komitet Narodnogo komisariata oborony (Artillery committee of Ministry of defense – a body responsible for firearms, similar to German IWG or American Ordnance Board), was testing and comparing the VMP1926 with the first Soviet submachine gun designed by F. Tokarev. On January 31st of 1927 the Committee issued final report stating that both compared weapons are equal in terms of reliability, but Tokarev’s design has barrel by 26,5 mm longer. This results in a longer line of sight and higher ballistic performance. As we will see later, this was not for the last time when the Vollmer’s weapons were in communist’s hands. During the Civil war in Spain the Republicans (i.e. communists or Reds) used EMP submachine guns in a substantial number. In 1926 Reichswehr tested again modified weapons. Once again there was neither decision nor a clear winner. Based on results of the trial, Vollmer changed magazine of his weapon, replacing the snail by a double staggered, double feed box magazine, similar to the ones used today. Capacity of the magazine was 30 rounds and the magazine was again horizontal, inserted to the weapon from the left side. Like probably all double staggered double feed magazines, the magazine was easy to fill. Sometimes it is mentioned that this magazine was inspired by the design of magazine of Luis Schmeisser (father of Hugo Schmeisser) for the Bergmann 1897 pistol, but for sure, no one challenged Vollmer for unauthorized use of a design. New weapon was marked VMP 1928 and Vollmer worked further on its improvement. In 1930 Vollmer presented upgraded version of his weapon, model VMP 1930. The design of this weapon was similar to the preceding model but for the first time he used here a telescoping guide / tube enclosing the main spring permanently joined with bolt. This significantly improved reliability of the weapon and also simplified field stripping. The design of the main spring enclosed in the telescoping tube in a one piece with the bolt Vollmer patented. The weapon was now field stripped only into the following parts: receiver with barrel, bolt with the main spring and body with the stock. Back sights of the VMP 1930 were either folding or tangent, Vollmer’s factory probably respected requirements of a client. Vollmer made about 400 pieces of this weapon and sold them abroad, mostly to Bulgaria. In 1930 IWG terminated financial support of further development of Vollmer’s submachine gun. The reason for doing probably was not lack of progress or loss of faith in the weapon, in 1930 the weapon was pretty mature (the only objective mentioned in the termination of support was high rate of fire which was by some sources 700 rounds per minute, by other sources 520 rounds per minute). Much more probable reason was financial crisis started by Black Friday on New York Stock Exchange in 1929 which dramatically reduced financial resources of Reichswehr. Maschinenfabrik purchased licensing rights for both the submachine gun VMP 1930 and telescoping main spring cover patent (D.R.P. Nr. 580620 issued in 1930 and accepted on July 13th of 1933). Erma adopted practically unchanged the VMP 1930 and started to market with two barrel lengths (200 and 320 mm). Erma later reintroduced the perforated heat shield around the barrel, but there were no other significant modifications. The weapon had a traditional stock with a small pistol grip on the hand guard; magazine remained in the horizontal position, inserted from the left side. Cocking handle was on the right side. Based on customer’s request the pistol grip might contain a telescoping monopod to help stabilize the weapon during fire. Since 1932 the weapon was marketed as EMP (Erma Maschinenpistole) or MPE (Maschinenpistole Erma) in Germany and abroad both. The literature indicates production of about 10 000 pieces but thus number is probably not correct, since serial numbers of surviving weapons indicate much higher production (in excess of 20 000). EMP exists in many different versions, it seems that Erma flexibly made small modifications of the weapon as per customer’s request. There are two major groups of versions differing by barrel length. What it seems to be a standard model had a barrel long 250 mm and simple double folding leaf back sight, zeroed on 100 and 200 meters. Second major variant had barrel long 300 mm and tangential back sight calibrates in 50 meter increments up to 1000 meters. This version usually has a bayonet attachment. On both versions we can sometimes encounter with a simple safety (bolt blocking) located on left side of the receiver. This safety prevented in case of a fall of the weapon on hard surface stock first so called self cocking and accidental discharge of the weapon. This kind of a safety is almost identical with the safety used on some pieces of M.P. 28,II submachine guns, but these weapons had the safety on the right side of the receiver. Trigger mechanism of EMP consists of trigger and sear with an interrupter. The sear works directly with the notch in a bolt. The weapon has a fire selector in form of a small rotating lever. Like most of the submachine guns, the EMP shoots from the open bolt (in back position). In a single shot regime the trigger presses by means of interrupter the sear. Sear releases the bolt and at the same time, interrupter slips from the trigger, releasing the sear. The trigger rests on the fire selector body which limits travel of the trigger. Once the bolt on its way back passes over the released sear, it is trapped by the sear and stops. The fire is interrupted. In a full automatic fire the trigger is not stopped by the fire selector body and by its nose squeezes permanently the sear. This way the sear can not engage the bolt and the fire continues as long as the trigger is squeezed and there are rounds in the magazine. Fire selector lever is placed on the right side of the weapon, above the front of the trigger guard. In a single shot position the lever is raised upward, in the full automatic mode the lever is almost horizontal, pointing forward. Positions are usually marked by letters E for a single shot mode and D for a full automatic mode. The weapon is field striped by means of a disassembly lever placed in the back strap of trigger guard. Once the disassembly lever is squeezed simultaneously with the trigger, the receiver with bolt can be rotated and removed from the body. As already mentioned above, this way of disassembly had the risk of accidental squeezing the disassembly lever during the fire, resulting in an uncontrolled, runaway burst until the magazine is empty or the receiver falls out of the weapon. It seems that later on, probably based on experience from the Civil War in Spain, Erma found out the risks of the here mentioned disassembly arrangement and introduced additional bolt lock / receiver lock in form of a small pin on the bottom of the handguard. When fully pushed to the body of the weapon, the lock blocked the travel of the bolt, its front tip engaging a hole in the bolt. In the intermediary position, the tip of the lock was out of the bolt’s way, enabling normal operation of the weapon. When pulled out of the handguard, the lock enabled rotation of the receiver and disassembly of the weapon. Disassembly of this kind has later been use in EMP 36 and subsequently in M.P. 38 and MP 40 design. Since 1936 the EMP submachine guns were (together with other weapons) used also by newly created SS, but many EMPs were exported to the latin America and Spain. In Spain the EMPs were even serially produced under designation M41/44 in caliber 9 mm Largo in armory in La Coruna. But before the Frankists, large amount of EMPs was used by republicans (Reds, Communists). The republicans probably even produced a limited amount of the EMP submachine guns. On spring of 1939, after a final defeat of republicans in Spain, remainders of (usually very multinational) republican forces retreated across Pyreneen to France. French armed forces disarmed the right on the border, but due to the excited international situation they stored all the usable captured weapons. At LCermont – Ferrand depot they finally assembled pretty impressive 3 250 EMP submachine guns, which were usually referred in French documents as Erma – Vollmer. Vast majority of these submachine guns was probably made in Germany, the true share of Republican production is not known but almost surely was very small. It is not known, how the EMPs get to Spain. Fact is, that while the La Coruna made M41/44 submachine guns were in caliber 9 mm Largo, the Republicans used submachine guns in 9 mm Luger. Let me now to speculate about these facts. Republicans received lot of armament from the Soviet Union (USSR). Soviet Union of that time had very good contacts with Germany; German armed forces trained and tested regularly their armament in USSR. After the break of Civil War in Spain the Republicans even dispatched majority of the Spanish golden reserves into “safety” in USSR. Soviets knew and had contacts with Vollmer already since 1927, when tehy tested VMP 1926 submachine gun. It is quite possible that Soviets somehow arranged procurement of the EMP submachine guns for the Republicans. I do not assume that the weapons were physically delivered to USSR, rather probable scenario is that the Erma delivered weapons into some German, guns were loaded aboard some Soviet (or neutral) ship under disguise of a fake end user certificate and on the see the delivery was diverted to some Spanish Republican port. But back to weapons captured in France in 1939. Via Swiss company Établissement Mécaniques de Precision France obtained additional few pieces of the EMP and French armed forces tested them. The submachine guns succeeded in test and France decided to adopt them into their own armed forces. On the break of 1939 and 1940 France even made a provisional regulation for this weapon Provisoire sur le pistolet-mitrailleur Erma – Vollmer de 9mm, issued on December 26th of 1939 a and immediately updated on January 6th of 1940. Distribution of the weapons to the units was hampered by the fact that there was no more 1 540 magazines for 3 250 submachine guns. In the heated situation of the time, French failed to procure or manufacture missing magazines, therefore only about 700 – 800 weapons actually reached troops. They were mostly issued to the units of volunteers and to the Gendarmerie a Garde mobile. In hands of these units the EMPs fought against Germans in 1940 campaign. After surrender of France and partial occupation of its teritory the EMPs were probably re-taken by armed forces of Third Reich, namely by SS, police and order forces. Missing magazines were probably promptly made Erma and weapons remained in service until the end of war. A nice example of it can shown in case of Legion des Volontaires Français, French voluntary legion established from French citizens that fought along on German side. The legion was established in July 1941 and since 1943 fought on German side on Eastern front. Legion grew in time, was transferred into the Waffen SS and finaly in October 1944 it became 33. Waffen-Grenadier-Division der SS Charlemagne (französische Nr. 1). As such it fought since February 1945 in Eastern Prussia (now north eastern Poland) where it was almost completely destroyed. And from here, from Poland, from places where this division fought, is known many surviving EMPs, almost all of them lacking any German military stamps and marks.